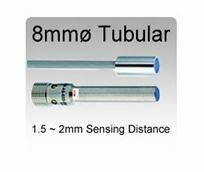 Browse here for 8mm and M8 self-contained PNP inductive proximity sensors for reliable detection of metallic targets without any physical contact.Offered in both smooth or threaded cylindrical housing, these rugged sensors are available with standard 2 meter pre-wired cable, pig-tailed connector or quick disconnect termination. 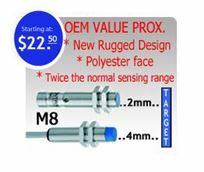 OEM Prox: New rugged design with 4 window bright LED & twice the normal sensing range! 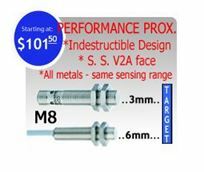 Perfect Cure Prox: Indestructible design, IP67-IP69K, & 3 times the normal sensing range! perfect proximity sensor for the food & bev, marine (sea-water) and machine tools industries. ONLY $93.00/each.